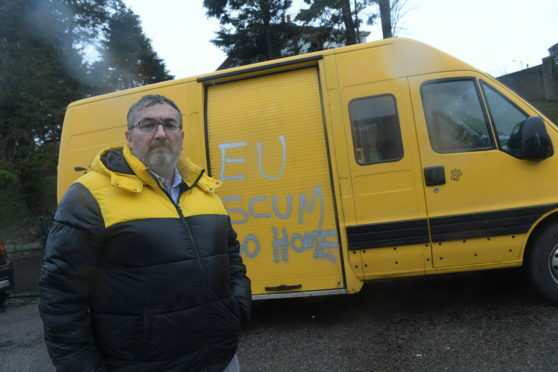 The vehicle, bearing French number plates, was parked in Polwarth Road in the Torry area with the words “EU scum go home” were written on it. But shocked residents awoke to the offensive messages scrawled along the side of the transit in the area that is heavily populated with people from other European nations. A study conducted after the vote to leave the EU in 2016 found that of Torry’s approximately 10,500 residents around a fifth on the western side were born outside of the UK. Slightly more than 11% of Torry West’s residents speak Polish at home, while another 8.9% speak another language, other than English, at home. The UK’s exit from the EU is now just weeks away, and it is still unclear exactly what will happen with EU residents living in the country. Last night a French-born councillor for the area raised fears that the population would be “worried” with just weeks to go until Britain leaves the organisation. Police said the incident had not been reported to them. Torry SNP councillor Christian Allard, who was born in Dijon, France and has lived in Scotland for decades, hit out at the vandals. He feared the van had been targeted due to its number plate and raised concerns that the high proportion of EU residents in the area were “worried”. He said: “I have looked at the graffiti and I can’t think of any other reason this van was attacked otherwise. “Luckily I haven’t seen anything else like this in the area. Meanwhile Aberdeen Central MSP Kevin Stewart has raised concerns to the Home Office about plans for a test centre for those applying for UK citizenship in the city. He wrote to government a year ago but still is in the dark about when the centre will open. Alistair Gray branded the delay “daft” and raised concerns about the costs he would have to endure having his Chinese wife travel to Glasgow to sit the test.